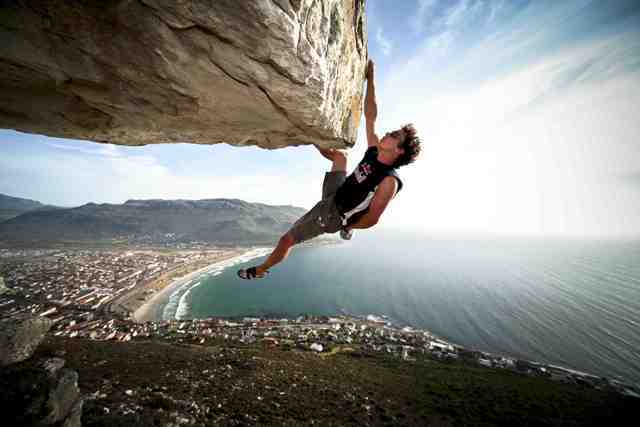 This image of climbing legend Justin Hawkins was taken on assignment for Red Bull in Cape Town. Justin is not only a world-renowned rock climber, but also a party animal of note – and he arrived at sunrise after a pretty heavy night of hitting the pubs and clubs in Cape Town. He insisted he was okay to do the shoot, but had a moment and asked, “can I rope up for that?” when he saw what I wanted him to attempt. I was adamant that I wanted to shoot it without protection, but only if he was a thousand percent sure he’d be okay. After half an hour of testing holds and scouting options, he gave me the thumbs up. I had to scramble onto an exposed ledge to get the right angle – overlooking the impressive sweep of False Bay near Cape Town – and Justin approached the hold over the top edge of the rock. The shot itself was relatively straight-forward: I used a Canon 5D with a 17– 40mm lens set to wide, and fill-in flash from a 580 Speedlight. I shot at 250th sec and f11 to compensate for the glare, with exposure compensation set to – 1 to help saturate the sky. Post-production was in Lightroom, with minor tweaks to levels and exposure. Jacques Marais is an author and photojournalist who specializes in outdoor adventure, travel and the environment. He belongs to The WideAngle, a worldwide network of photographers who contribute to some of the best publications on the planet. For more images by The WideAngle photographers, please click here. I swear, my heart is beating feverishly just looking at this. Incredible!